Our family took tons of vacations to St. Petersburg & Clearwater when I was younger, and I have so many great memories from the area. Located across the bay from Tampa, St. Petersburg and Clearwater are two of the best beach cities for a Florida vacation. In St. Petersburg, be sure to spend an afternoon at the Pier, John’s Pass, and Indian Rocks Beach. Nature lovers won’t want to miss Caladesi Island State Park, which is an undeveloped area with tons of beaches and nature trails. Clearwater is home to one of the best beaches in Florida, and has a ton of resorts to choose from. We like that you can explore both areas in one amazing Florida Vacation. One of our favorite resorts for a Florida vacation is the Don Cesar in St. Petersburg. 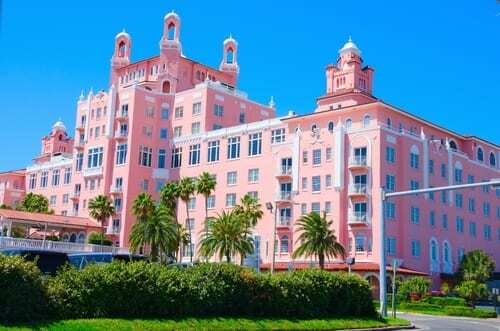 It is known as Florida’s “Pink Palace”, with its majestic pink exterior and striking architectural design. The hotel itself is a National Historic Landmark and a member of the Historic Hotels of America. 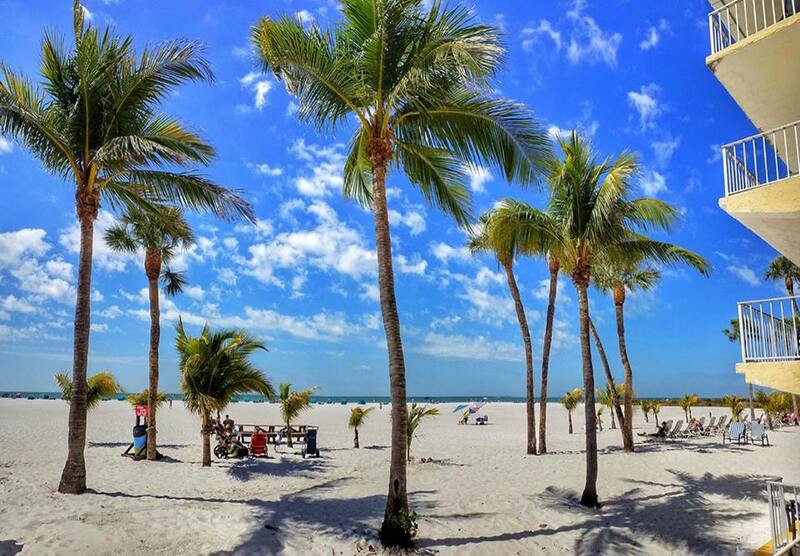 Fort Myers rivals St. Petersburg and Clearwater when it comes to the perfect Florida vacation destination. Fort Myers Beach is located on the shores of Estero island, and separated from the mainland by a narrow inland waterway. It is connected to the mainland by bridges. You will probably see dolphins in the water during your visit to the beach, as it is known for dolphin sightings. You’ll also find tons of great resorts for families and couples along this famed beach. Downtown Fort Myers, or the River District, has tons of shopping and dining, as well as historic buildings and museums. The Outrigger Beach Resort is an affordable 2-star property that is great for families or couples. The beach is absolutely huge and stunning, with some of the whitest sands you’ll find in Florida. It has a boutique vibe with just 144 rooms and two casual restaurants. We love the nightly live music at the Tiki Bar. Naples is an upscale area on the southern tip of Florida’s Gulf Coast. You’ll find your fair share of mansions and condo towers here, but the downtown area maintains a charming small-town feel. Head to Third St. South and 5th Ave South for trendy restaurants, art galleries, and boutiques. Don’t miss the Naples Pier, which is the city’s most famous historic landmark. This is a great destination for golfers and has a reputation as a high-end golf resort town. The historic Naples Beach Hotel & Golf Club has been welcoming guests since 1946. With a 7-miles private beach and award-winning golf course on site, this is truly a playground by the sea. You’ll find an impressive spa, multiple pools, and beachfront dining options. Marco Island is located as far southwest as you can go in Florida without hitting the Everglades. Here you’ll find a laid back vibe and a massive network of canals, making it a unique Florida vacation destination. This is a very quiet area of Florida. In fact, the local joke is that “Marco midnight” is at 9 PM – meaning there is no nightlife after 9! This is a great destination for a laid-back honeymoon or for a family looking for relaxation. 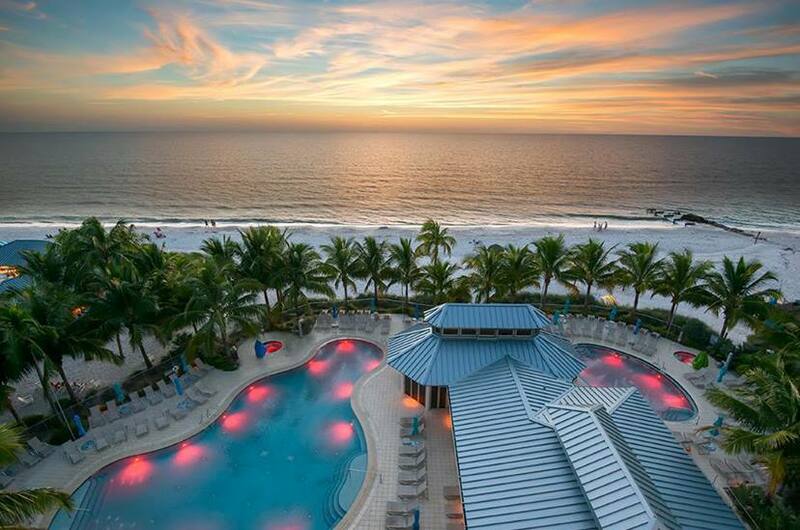 Nestled along miles of white-sandy beach, Hilton Marco Island Beach Resort and Spa appeals to families, spa-lovers and active travelers. Here you’ll find live nightly entertainment, comfortable suites with private furnished balconies overlooking the Gulf of Mexico, and more. Family-friendly amenities on the resort include babysitting services, a children’s activity program, and children’s menus at most of the restaurants. 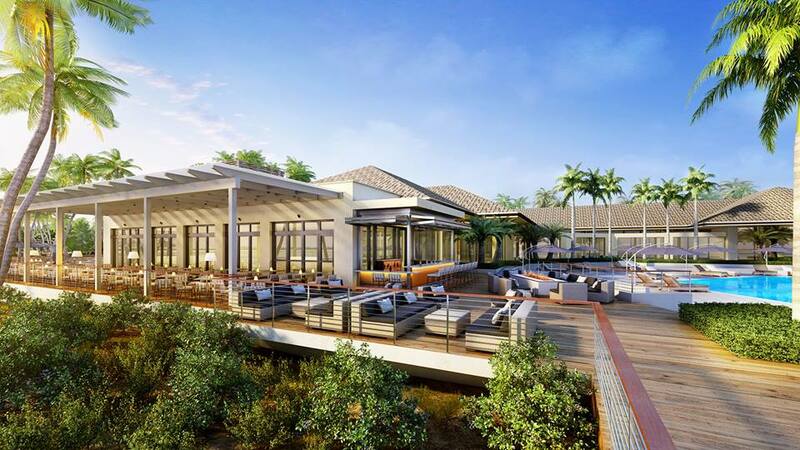 It is also conveniently located near world-class golf courses, the Florida Everglades National Park, and more. Call us today to book your own Florida vacation! You can reach us at 402-390-9291.